The original Batesville Town Hall, two stories high, was built in 1887 on the corner of Main Street and Catherine Street. It officially became city hall in 1909, fifty-seven years after the platting of the town. The Memorial Building, which was built as a monument to the men and women who answered the call of duty in World War I, was completed in 1923 to replace the existing town hall. Architect Karl P. Hinkel, Connersville, was commissioned to design the building. The original plan included a gymnasium and kitchen on the basement level, council chambers, community rooms, and an auditorium which included a stage on the second level. The auditorium could seat 500 people with the balcony holding 300. The materials used were brick, hollow tile, cement, and tile throughout. 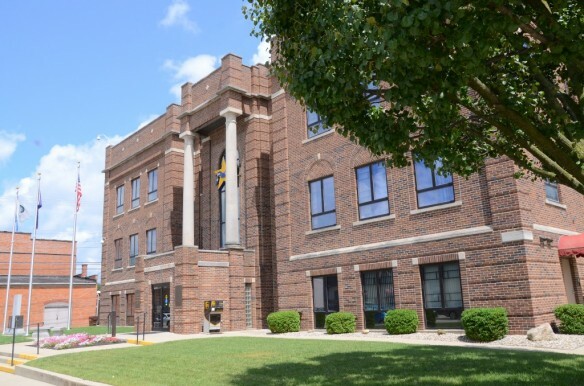 On September 11, 1993, the Memorial Building was rededicated after renovations to this historic landmark of Batesville were completed. The long, central staircase was removed and the main lobby was relocated to the ground level. Today, the Memorial Building still houses the governmental offices of the mayor, clerk-treasurer, building commissioner, and the police department. It continues to be seen as a vital landmark in downtown Batesville.